I'm a vintage shopper by trade, something you may or might not know. In fact, the Lune Blog started off as a way to showcase my finds through my online shop Lune Vintage (still rocking after all these years). Whenever I go to a new city, I always find where the vintage is. 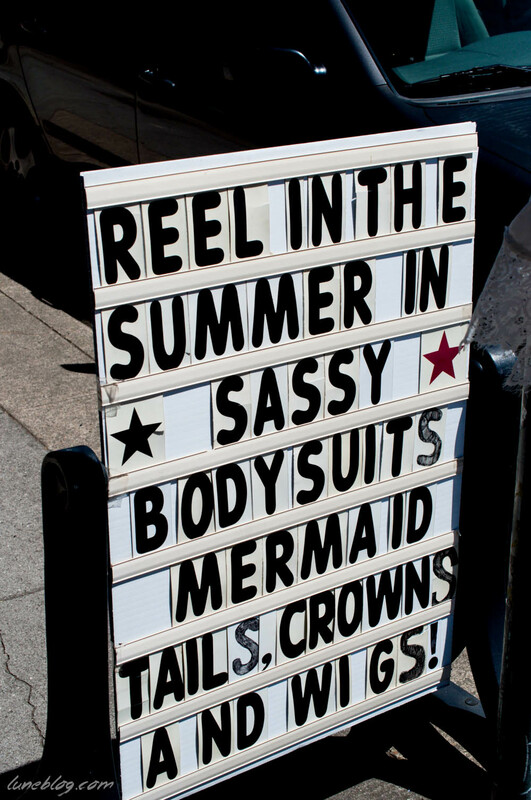 As you might imagine, quirky crazy Portland had plenty of it. 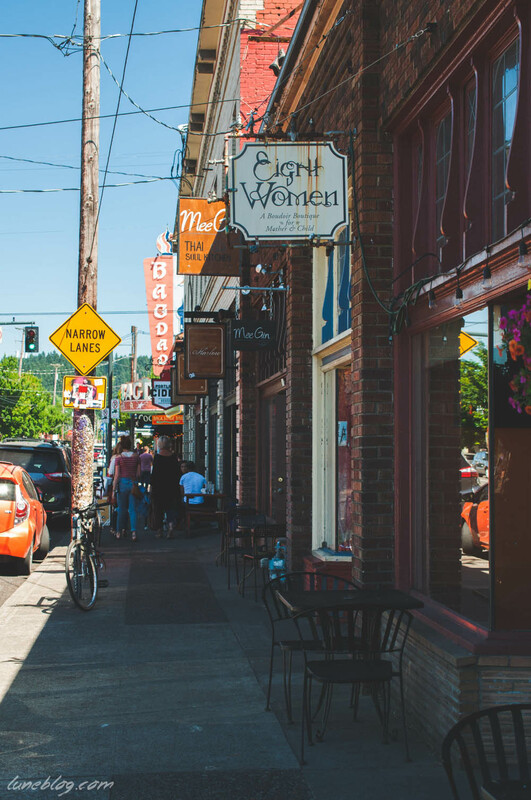 Here are a few photos from our walk down Hawthorne Ave in Portland, Oregon. The Red Light Clothing Exchange is a large, eye catching boutique that sells a ton of unmistakable 70's, rock-n-roll, rock-a-billy, rave wear that sent me back to my teenage years in the mid 90's. Velvet nudes adorn glossy red walls alongside band t's and motorcycle jackets, while clouds of colourful dyed crinolines and decade old polyester prints float above you. This boutique accepts consignment and has some new accessories as well. The House of Vintage is your Vintage Wonderland (as the sandwich board outside states). Yeah. It's A LOT. Set up in the consignment format, it seemed to be sorted out like an vendor mall with sections of racks per seller. Clothes upon clothes upon clothes my friends! It's actually pretty overwhelming, which some people might enjoy - depending on your shopping style. Give yourself a solid hour to explore all the nooks in this expansive warehouse. Vintage Pink is a Retro Home and Fashion Boutique that had a real cool vibe. The focus here is definitely on furniture and decor. It's sorted nicely, colourful and fun to browse. You really can't miss it's pink atomic exterior paint job. 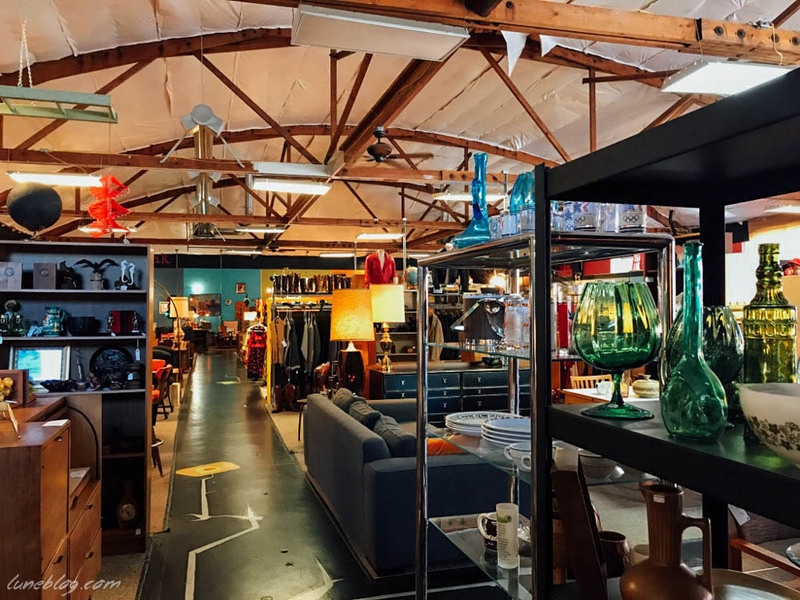 I really liked Hawthorne Vintage Modern for midcentury furniture and housewares. If I were shopping for my own home, this is where I'd go regularly. I loved the focus on 60's and 70's era decor. Pictured above is Naked City which has a fun mix of repro rockabilly vintage, punk and weird stuff. Not a vintage store, but worth checking out. I asked my friend Sadie Lou Vintage, a Portland native, to share her top pics for vintage shopping in the city. She suggests Redlight Vintage, both for shoppers and consigners because business is brisk and there's a lot of rotation and new items. Also on her list is Red Fox Vintage and Buffalo Exchange. 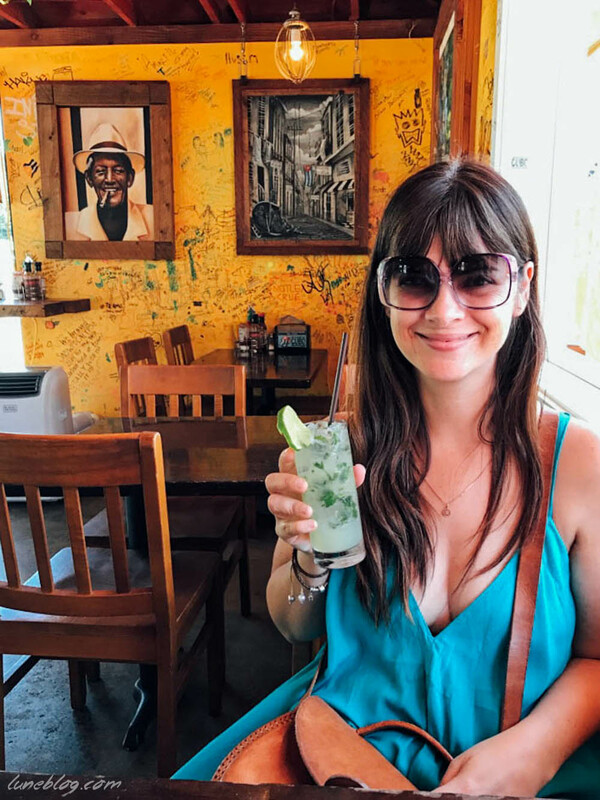 From our experience, you won't have any trouble finding awesome vintage shopping on Hawthorne Ave. Just make sure to make a few stops for refreshments like we did at Cubo and the Portland Cider Company. Pretty much makes for a perfect day! Thanks for the great vintage shopping Portland!